This album could scare the living hell out of people like Sessions and maybe even our current leader. Not only does it have many unhinged qualities that we can expect from someone affiliated with the Association for the Advancement of Creative Musicians. Mandorla Awakening II: Emerging Worlds is also built on an underlying story line about a couple from the decaying World Union society who discover Mandorla, an island in the Atlantic where, unknown to the rest of the world, people like in an egalitarian society, in peace and harmony. The couple has to decide whether to continue in their "dystopic" world or move to a "utopic" one. The music (and words) tell how the decision is not so easy or clear cut. Ideas like this seem like just the thing to make our leaders uncomfortable. Cooperative (and peaceful) societies going up against aggressive, hierarchical societies. It seems to shake up the status quo, asking for common sense and cooler heads to prevail. It forces people to reexamine their perspectives. Mitchell's music has gone to the dark side before, using Afrofuturist author Octavia E. Butler as an inspiration for albums like Xeogenesis Suite. Musically she takes things even further with a version of her Black Earth Ensemble that features shakuhachi (Kojiro Umezaki), violin (Renee Baker), electric guitar/oud/theremin (Alex Wing), bass/shamisen/talko (Tatsu Aoki) and percussion (Jovia Armstrong). Three tracks include vocals by poet/scholar avery r young. The players often work in different combinations. 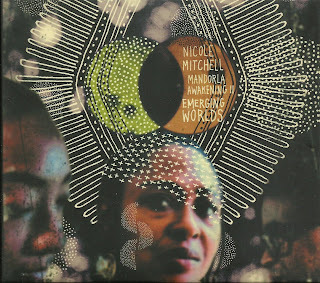 "Egoes War" opens with free percussion that betrays the AACM influence on Mitchell, before Wing adds some frenzied guitar. "Dance of Many Hands" starts out sounding like a folk tune, albeit one in 5/4, with guitar plucking out a melody while the flutes float over it, climaxing with a passionate cello solo. It's followed by "Listening Embrace" a multi-tiered track which includes Reid on banjo and a duet between Mitchell's expressive flute and the raw, nasal drone of Aoki's shamisen. The vocal tracks don't come until more than halfway through the album, making it feel more like an intense set of instrumental music up to that point. They can be a challenge, with young delivering them with heavy enunciation to make sure the points aren't missed. Upon hearing them cold, without any knowledge of the album's concept, they felt a little hard to swallow. But reading Mitchell's program notes, and using the lyric sheet for reference, things make a bit more sense. Music like this is supposed to challenge listeners, even as it leaves them spellbound. Yes, this is intense music but the times require sounds like this to keep us awake and aware of what's reallly going on around us.